Burgess Hill Town face a replay against Worthing tomorrow night (Tuesday) - and they now know the reward if they win. 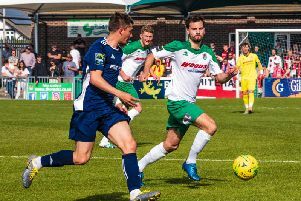 Striker Kieron Pamment struck against his former side Worthing to force a replay in the Bostik League Premier Division rivals' FA Trophy first round qualifying tie at the Green Elephants Stadium on Saturday. And the winner tomorrow night will face either Haringey Borough or Chesham United in the next round.